The talk of Saint Ignatius in the last post, has given me an idea. I think there are many people who are interested in the life and the spirituality of Saint Ignatius. 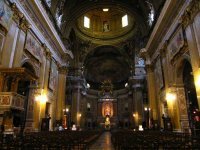 So, beginning today, I’m going to offer a short excerpt from Saint Ignatius’s autobiography, followed by a brief reflection, and invite your reflections on the same. The text is taken from a translation by William J. Young, S.J. Note: Though this is an autobiography, Saint Ignatius speaks of himself in the third person. Up to his twenty-sixth year he was a man given over to the vanities of the world, and took special delight in the exercise of arms, with a great and vain desire of wining glory. He was in a fortress which the French were attacking, and although others were of the opinion that they should surrender on terms of having their lives spared, as they clearly saw there was no possibility of a defense, he gave so many reasons to the governor that he persuaded him to carry on the defense against the judgment of the officers, who found some strength in his spirit and courage. On the day on which they expected the attack to take place, he made his confession to one of his companions in arms. After the assault had been going on for some time, a cannon ball struck him in the leg, crushing its bones, and because it passed between his legs it also seriously wounded the other. With this fall, the others in the fortress surrendered to the French, who took possession, and treated the wounded man with great kindliness and courtesy. After twelve or fifteen days in Pamplona they bore him in a litter to his own country. Here he found himself in a very serious condition. The doctors and surgeons whom he had called from all parts were of the opinion that the leg should be operated on again and the bones reset, either because they had been poorly set in the first place, or because the jogging of the journey had displaced them so that they would not heal. Again he went through this butchery, in which as in all others that he suffered he uttered no word, nor gave any sign of pain other than clenching his fists. As someone who was a little late to the whole vocation thing (I was 29 when I entered the Jesuits), I always find it comforting to know that Saint Ignatius was kind of late getting there too. When I despair of the long Jesuit formation process, or the fact that I’ll be 40 by the time I’m ordained, I remember that Saint Ignatius was on a similar track. And, hey, he managed to do a few things, didn’t he? I also love this opening to the autobiography for many reasons. First, Saint Ignatius, in his humility, begins by describing one of the more foolish things he did in his life. He let his pride and his “delight in the exercise of arms” get the best of him, and he threatened the lives of others with his foolish insistence on fighting an unwinnable battle. Yet, at the same time, he recognizes that if not for this foolishness, his life might not have taken the fortunate turn that it did—sometimes it takes a cannon ball to wake you up to what life is really about! I also, like what it reveals about the Ignatius, now Father General of the Jesuits, who is recounting this story years later. Though he is no longer “given over to the vanities of the world,” you can still sense a little bit of his pride coming through when he feels compelled to add, “Again he went through this butchery, in which as in all others that he suffered he uttered no word, nor gave any sign of pain other than clenching his fists.” When my pride gets the best of me—all too often—it’s comforting to know that even a long-tested saint is not immune from it either! amen to that. even our weakness can be used for our apostolates. I'll stick with the prophet Jeremiah and still call it "duping," but in a good way! You'll find it in my July 2005 archives. Thanks for asking, and stopping by! You think you came late to the party? I didn't start Gradual school till I was 43. If I ever get the language requirements figured out I will be well past 50 before I get my PhD in Theology. "Late have I loved thee." makes more sense every year.